Classic Treasury Bedtime Stories is brimming with timeless short stories that children will love by well-known authors such as Rudyard Kipling and L Frank Baum. Each tale has been specially selected for bedtime reading and individually illustrated, creating a dream world for kids to explore. # Fantastic stories for adults and children to read and enjoy together.# Charming artwork throughout to engage readers of every ability.# Beautiful hardback covers with flocking (furry material) make this book a wonderful gift. 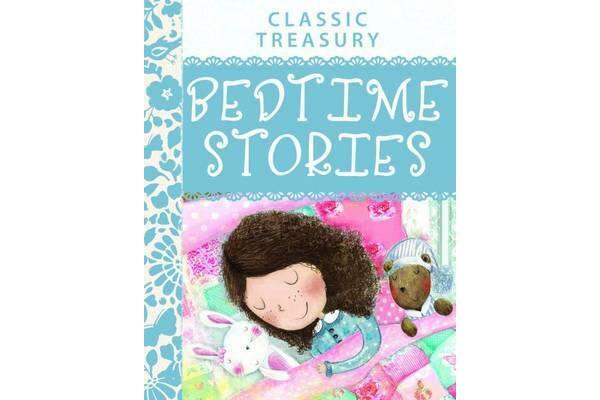 Synopsis – Product detailsClassic Treasury Bedtime Stories can be read to young children or enjoyed by independent readers aged 7+. Children will meet bold lads, brave girls and a host of magical creatures in a land where dreams come true. Each chapter has a different exciting theme so that children can cosy up in bed with what will soon become one of their cherished bedtime story books. Chapters and stories inside Classic Treasury Bedtime Stories: # Bold Lads and Brave Girls chapter includes The Wise Girl by Katharine Pyle-#Strange and Magical Tales chapter includes The Husband of the Rat’s Daughter by Andrew Lang# Along the Road chapter includes The Two Sisters by Flora Annie Steele# What Nonsense chapter includes Tikki Tikki Tembo# Birds, Beasts and Dragons chapter includes How the Camel got his Hump by Rudyard Kipling The opening of The Two Sisters: Once upon a time there were two sisters who were as like each other as two peas in a pod, but one was good, and the other was bad-tempered. Now their father had no work, so the girls began to think of going to be servants. “I will go first and see what I can make of it,” said the younger sister, ever so cheerfully, “then you, sis, can follow if I have good luck.” So she packed up a bundle, said goodbye, and started to find a place, but no one in the town wanted a girl, so she went farther afield into the country.